WordPress has recently reached another amazing milestone: it is now used by more than 30% of the web. This is significantly more than all the other 392 content management systems in our surveys combined. WordPress is by far the fastest growing system and it was our Content Management System of the Year for the 8th year in a row. Its usage among new sites is even higher at 35.5%. But WordPress is not a one-size-fits-all solution. It has a vast ecosystem of more than 50,000 plugins, which webmaster can use to tailor the system to their needs. Most of these plugins provide some narrow functionality, such as SEO optimizations, caching, some administration features and much, much more. Some of these plugins, however, provide a very significant amount of typical functionality of a CMS. These systems can almost be seen as a separate CMS developed on top of WordPress. We have selected the most important ones and started to track their usage (the only other WordPress plugin we track in Jetpack, the third most-popular traffic analysis tool). WooCommerce is the most popular e-commerce plugin for WordPress. It is used by 3.5% of all websites, that is 11.5% of all WordPress sites. That makes it more popular than stand-alone e-commerce systems such as Magento (1.1%), Shopify (1.0%) and PrestaShop (0.6%). 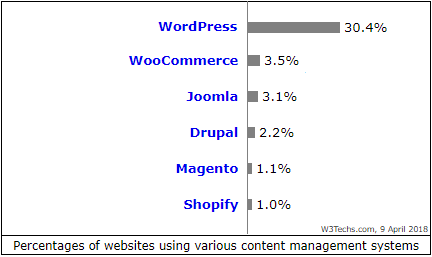 Actually WooCommerce is more popular than any CMS except WordPress, including Joomla and Drupal. WooCommerce is particularity popular on Persian, South African and Vietnamese sites, less popular on Russian and Japanese sites. It is less popular on high-traffic sites than on average ones, and it is much more popular on sites hosted by DigitalOcean or SingleHop than on sites hosted by Amazon. WooCommerce is often used by sites that also use Cloudflare or Sucuri as content delivery network, rarely by sites that use Akamai. A distant second of the WordPress-based systems is bbPress, which provides forum functionality. At 0.4% it is almost twice as popular as vBulletin, the most used dedicated forum-CMS. NextGEN Gallery is the most popular WordPress-based photo gallery system. It is used by 0.3% of the web, and again this is much higher than any stand-alone photo gallery systems. We currently track 17 of the most important WordPress plugins that satisfy our criteria of providing some major CMS functionality that is otherwise typically provided by a separate CMS. You can find them as subcategories on our WordPress page.